Could injuries to Shelvey and Lascelles be responsible for upturn in fortune for Newcastle United? As 2,500 jubilant Newcastle United fans celebrated their third successive victory, and first away from home, at Burnley last night, a lone player came out with one of the fitness coaches and started going through some light running exercises. Wrapped up against the elements, with a snood and hat hiding his distinctive features, it took a while for many of the fans to realise that the player in question was Jonjo Shelvey, who had remained on the bench for the duration of the game. Three games earlier Newcastle were still searching for their first win of the season and drawing 0-0 with Watford at halftime in front of a nervous St James’ Park. The team’s captain Jamaal Lascelles pulled up lame at halftime and then five minutes into the second half he was joined by Shelvey in the treatment room. 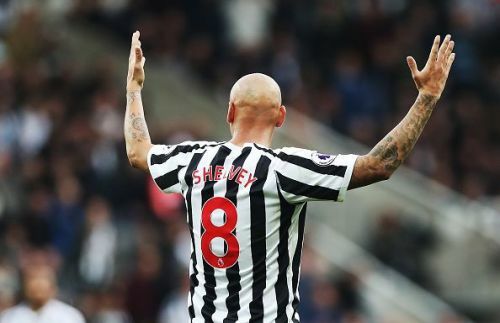 The groans from the restless natives in the stand suggested that Shelvey’s withdrawal was going to be the final nail in the coffin for any hope of claiming their first three points of the season. But surprisingly the lack of their two talismen has produced a remarkable, and instant, upturn in fortunes for Rafa Benitez’s side. The injury to Lascelles created an opportunity for Fabian Schar, whose composure on the ball helped his team take the game to Watford, while the injury to Shelvey created an opportunity for Ki Sung Yueng, who won and then took the free kick that led to Ayoze Perez securing Newcastle’s first win of the season. Both players have remained in the team since and have played crucial roles in the three game winning run that has eased the pressure on the club, allowing the team and the fans to start looking up the table and not over their shoulder. The fact this has been achieved without two players who have been key to everything Benitez has achieved in his two and a half years in charge is perhaps the most surprising thing, with Shelvey and Lascelles both knocking on the door of the England World Cup Squad after their performances last season. When you delve a bit deeper into the stats, it’s easy to see where the improvements have come. Schar completes more interceptions, tackles and clearances than Lascelles. They both have similar pass completion success but Schar plays double the number of long passes which has worked successfully now that Salomon Rondon has found some form. Shelvey is renowned for his passing range but he has a completion of just 68% this season and has no assists. Ki Sung Yueng’s is significantly better, with an 81% completion and the crucial assist in the game against Watford. The fact the England hopefuls haven’t been missed, is testament to the performances of Schar and Ki Sung Yueng but also the continued clever work in the transfer market that Benitez has done on a shoestring budget. Ki Sung Yeung was signed on a free transfer with Schar costing just £3 million. Newcastle fans can only dream about what Benitez could achieve with an owner who truly backed him.